It’s been a minute since I’ve sat down to write a blog; with the busyness of Seminary, motherhood, reading, writing, and [no arithmetic], I’ve had little time to do anything else. I’ve also been waiting for the new things I’ve learned about God and the bible to settle in a bit before I hit you guys with anything. Bear with me! However, today is a day to write. Fear is paralyzing. It keeps you stagnant. 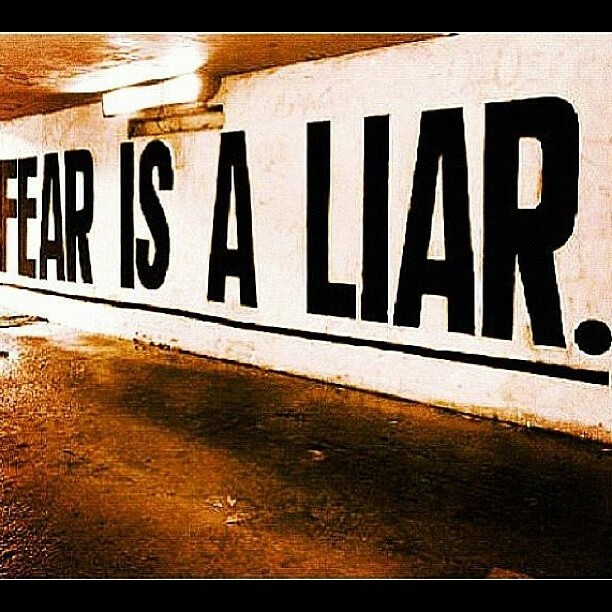 Fear puts your feet into cement blocks so you cannot move. It renders you helpless to help yourself and will drive you to pull away from the very purpose for which you are called. Fear will cause you to believe that what you have been destined to do/have/be is only reserved for someone not as [insert flaw/short coming here]. Fear will cause you to shy away from opportunities to grow, stretch, and shape yourself into the person you see in your head. It is, my friends, the ultimate paralyzer. Wow. So, paralyzing fear not only can keep your physical body from moving forward, but it can cause you to be unable think or act normally. (I read normal to = what you were created to do/have/be). This means that what you are trying to accomplish right now — in any capacity — is and should be normal for you. It was why you were created. A telephone is not afraid of being a telephone. It makes and receives calls because that’s what it was created to do. It does not shut down, run away, or hide it’s capabilities because of the fear of being itself. It simply does what it was created to do. No fear. What I’ve come to realize is that my fear is deeply rooted in what Myleik’s fear was: that I am not deserving or do not need what it is I desire. There are more deserving people. There are greater causes for which I could rally to help others achieve their dreams. I am too this, or too that, or not enough. We tell ourselves these lies for so long until they become ingrained in everything we do and say. Sometimes, we need a shake, a wake up call to let us know that we deserve everything and more… and be foolish enough to believe it. What do you have to lose? How often are we afraid of failure when we’ve done nothing to even approach the thing of which we are afraid of failing. I don’t know who this is for or who it will help, however, I challenge all of us to look deeply into the reasons behind our fears; conjure them up, stare them in the face (because you may be the very thing that you’re afraid of!) Acknowledge them. Then, do something totally opposite of what you’re afraid of. It can be something small; take baby steps. Get free of fear. It is nothing but a dirty liar. Exile from Egypt: Real or Fake? Love this post. Fear is only present in the absence of faith right? Very timely. It helped me as I move into God’s purpose for my life. Thank you, Alisha.